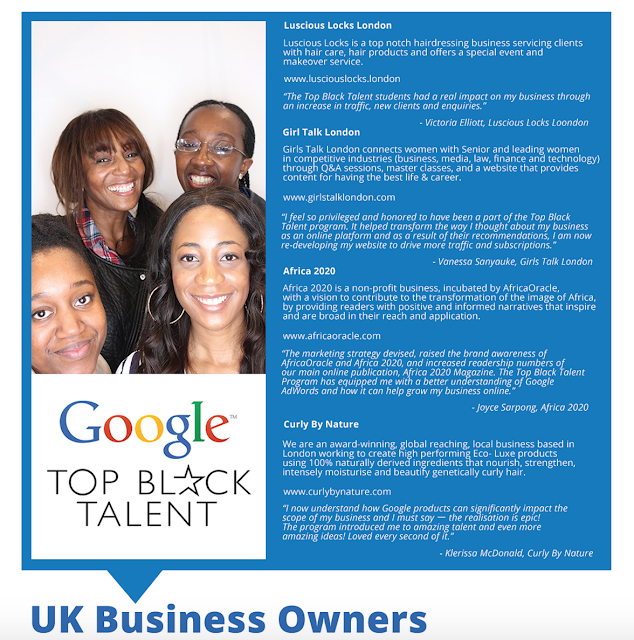 The Top Black Talent program is Google’s award-winning outreach program designed to identify and develop the UK’s top black university students interested in business careers within our SMB (Small to Medium Business) teams. Participants took part in a seven-week, high touch mentoring program at Google London. The 2015 Google mentors were: Stephanie Sibanda, Javid Aslanov, Hannah Pennington, Davy Denke, Joanna Matuszyk and Martin Barnett. Four student teams were created and partnered with four black female entrepreneurs based in London. Each team was tasked with competing in the Google Online Marketing Challenge. In line with the challenge, each team received a $250 AdWords advertising budget from Google and ran an online advertising campaign for the business owners. We're excited to announce that three 2015 Top Black Talent participants – Leon Johnson, Bjion Henry and Christina Okorocha – will join Google this summer as Business Interns in the SMB Sales and Global Customer Experience teams. The Google Online Marketing Challenge was your main project. Tell us a bit about GOMC? Ololade Olaore: I learned so much about digital advertising and the impact that Google products, such as AdWords, can make on small and medium-sized businessesーwho can not necessarily afford a marketing director. If you asked me what Google Adwords was before completing the Challenge, I would not have had a clue, but ask me today and I could go on for hours about how it can help businesses grow. Olivia Crooks: GOMC was challenging (in a good way)! My team had to learn about common issues faced by small-medium sized business and find ways around these issues. This made GOMC really engaging. If you have the opportunityーdo the Challenge! What did you gain from your interaction with a real client? Olivia Crooks: As a university student, making an actual impact on a real business felt amazing. As a team, we worked towards the clients goals, but also had the freedom to present ideas which were contrary to the clients first assumptionsーwith the aim of identifying opportunities to grow the business. Through this experience, I definitely developed important client-facing skills. Bjion Henry: The business we worked with had very unique challenges and goals. It was fun spotting new opportunities for growth, and working with the client to strategize how we would go about achieving targets. What kind of support did your Google mentor offer? Leon Johnson: Together with my Google mentor, Stephanie Sibanda, we created a personal development plan (PDP) – which helped me to set various short- and long- term goals. The depth of my PDP has allowed me to analyse and better arrange my academic, career and home life. By consistently revisiting and revising my PDP, I hope to accomplish each and every one of my set goals. Bjion Henry: My Google mentor, Javid Aslanov, guided me to identify relevant skillsets and attributes needed for a successful career and advised me on the various routes into the tech industry. What’s more, my mentor gave invaluable insights into Google’s culture and better prepared me for applying for an internship. What was your favourite program highlight? Leon Johnson: Helping the business owner: I grasped the opportunity to make a real impact on the business. Our team’s hard work was rewarded by winning the Top Black Talent program challenge ー this was absolutely amazing! Olivia Crooks: Interview preparations: my mentor helped prepare me for the types of questions I would be asked during interviews, for roles in Google’s SMB (Small and Medium Business) Sales and Global Customer Experience teams. He also offered great insights into Google’s culture in Poland, Ireland, and all the other Google offices, where my mentor worked in the past. The Top Black Talent program is currently closed for applications; however, please do check out how you can join next year’s GOMC Challenge, complete the Digital Marketing Course and become AdWords certified.